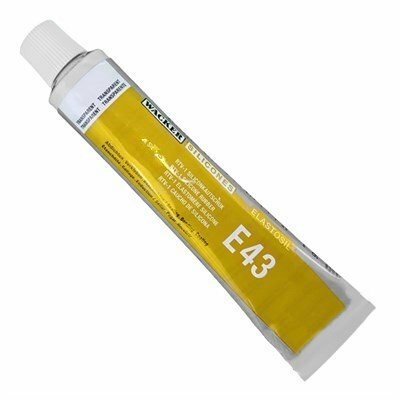 Elastosil E43 transparent multifuncional glue for Silicones. Tube 90 ml. ELASTOSIL® E43 is a self-levelling one-component silicone rubber with very good mechanical properties, which cures at room temperature under the influence of atmospheric moisture. ELASTOSIL® E43 shows good primerless adhesion to many substrates. We recommend running preliminary tests to optimize conditions for the particular application. Please sand, clean and degrease surfaces. Use tolueen or alcohol and leave this to evaporate fully before applying the glue. Drying time is 15 minutes 20 oC und 50% relative humidity. Full strength after 24 hours 20 oC und 50% relative humidity. After opening shelf life is reduced to only a few months. During vulcanization of ELASTOSIL® E43, a total of 4% by weight of acetic acid is split off. These vapours should not be inhaled for long periods or in high concentration. Work areas should therefore be well ventilated. Contact of unvulcanized silicone rubber with eyes and mucous membranes must be avoided as this would cause irritation. However if it does happen, rinse the affected area thoroughly. available on request from WACKER subsidiaries or may be printed via WACKER web site http://www.wacker.com.